Summary: You may have heard about the Antonio Villas Boas abduction case in 1957 (Brazil) and about the Betty and Barney Hill abduction case in 1961 (USA), but have you ever heard about an attempted abduction that took case long before these two cases, in 1954? 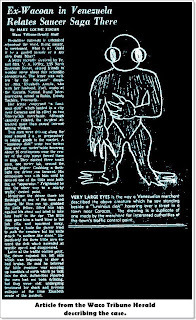 This incident involved two men who successfully avoided abduction by fighting against extraterrestrials. What makes it an extraordinary event is that an extraterrestrial was very nearly kidnapped by a human, who tried to apprehend him and put him into a van. This strange incident took place in Petare, Venezuela. On 29 November 1954, between 2:00 and 2:30 in the morning, Gustavo González, a 25-year-old Cuban businessman living in Venezuela, and his Venezuelan assistant, José Ponce, were aboard Gustavo’s van, on their way to the “Industria Nacional de Embutidos C.A.” or “Schelper” meat processing plant, located on Buena Vista street in Petare, in order to obtain products to sell in the market at daybreak. Driving along Buena Vista Street, they were surprised to see the street illuminated as though it were 12 noon. Upon exiting the van to see what was afoot, José suddenly ran back toward the vehicle after seeing a strange entity approaching them. Seconds later, Gustavo also saw the creature and was at first hesitant, but then advanced toward it and wrapped his arms around the being to capture it and drag it back to the van. The small alien, however, was rather strong and managed to break away from the hold. Upon releasing itself, Gustavo fell to the pavement, but managed to spring up quickly. According to Gustavo, the entity weighed some 50 kilograms (110 pounds) when he lifted it. While he followed the small alien, he noticed something even more surprising: two other small aliens were approaching him. One of them flashed him with a “flashlight” – apparently they had come to assist their comrade. Blinded by the light and unable to see what was happening for a few seconds, he took hold of his Boy Scout knife when his vision was restored, and saw that the same diminutive alien was now coming toward him. Instinctively, the man stabbed the creature’s shoulder, only to feel the blade slip off its skin, which was as tough as rhinoceros hide. When the extraterrestrial tried to seize him, Gustavo realized it had sharp claws on each of its four fingers. 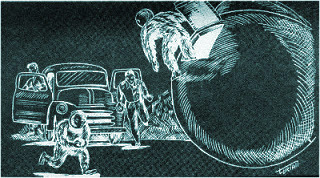 Meanwhile, his assistant, José Ponce, emerged from the right side of the van and headed toward the spherical object. Suddenly, a small hairy extraterrestrial emerged from the right, hurriedly walking up a steep slope with fistfuls of dirt in its hand. When the tiny alien noticed Ponce, it jumped two meters, entered the hatch and vanished into the object. Seconds later, another entity emerged, armed with a long, shiny tube in its hands, pointing it at both men. They suddenly felt a vibration that encompassed their bodies – Gustavo and José were rendered paralyzed. They later saw the brilliant sphere rising majestically and silently to a point in the night sky before vanishing altogether. José Ponce ran to the Traffic Office in Petare, located on the same street where the bizarre event took place. 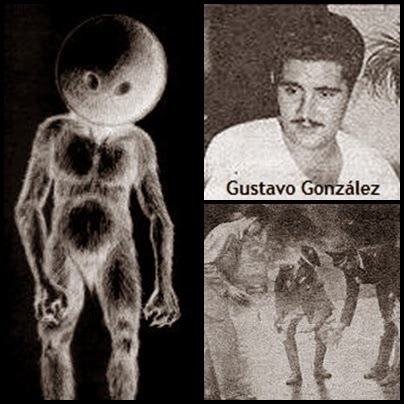 Minutes later, Gustavo Gonzalez arrived at the same location, and after having a drink of water to recover from the ordeal, both men enthusiastically described their experience to the duty officers – Manuel Moreno and E. Dominguez, stated that both men entered their office at 2:30 in the morning with that “story”, but that they were neither drunk nor insane. What they said and described was true, packed with details that seemed real enough. 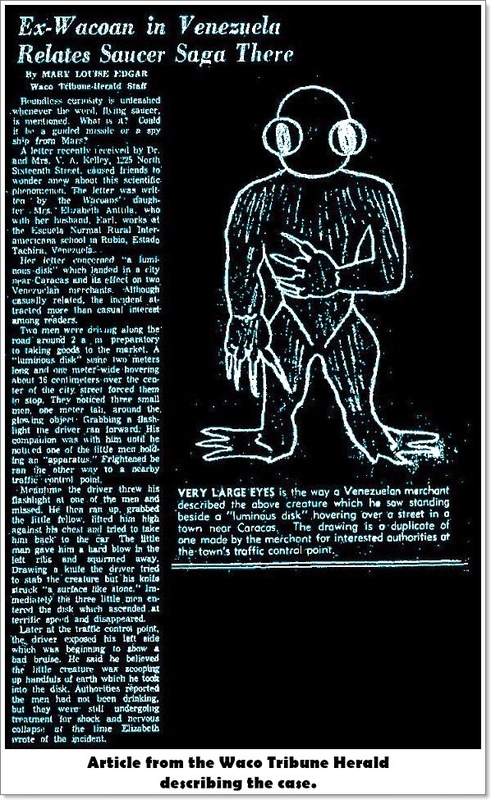 José Ponce and Gustavo were able to describe the aliens thus: the one Gustavo grappled with was hairy, noseless, with glowing eyes, short stature, barefoot and wore a strange item of clothing resembling a loincloth. It was very agile and strong for its size and was able to break away from his grasp, leaping like a cat. Later in the morning, officer Jesus Antonio Yanes declared that what had occurred to Gustavo and José was unique. Subsequently Gustavo complained of a pain on his left side and was taken to a hospital to receive medical attention. An x-ray was taken at three in the afternoon (15:00 hours) to discard the possibility of a fractured rib, but muscular distension was found on that side of his body. Following the incident, people who knew both men personally stated that they must have had an extraordinary experience, and had proven they were not drunk. Antonio Cherchi, manager of “Industira Nacional de Embutidos C.A.” or “Schelper” stated he knew Gustavo and José from seeing them and dealing with them, and took them for serious, hard-working people who arrived at two o’clock a.m. every day to retrieve their products. He also acknowledged having never received any complaints about them, or having noticed anything unusual about them. If they say they saw something or had contact with something, he believes them. Moreover, journalists who interviewed them ascertained that Gustavo and José were not intoxicated at the time of the incident. Had they been drunk, the traffic authorities would have reproved them for it. Furthermore, when Gustavo was taken to the emergency room, he was somewhat nervous and his left side appeared a little bit bruised. Two others testified to having heard or seen something on Bella Vista Street. One of them was Ms. Maria Antonieta Avellaneda, who stated she was awake between one and two o’clock in the morning, and at the time of the incident felt something “like an explosion and sibilant hiss” but paid no mind to it, because she was preparing a remedy for a sick child in her home. Likewise, Mr. Concepcion Garrachan, who lived in Petare, noted that hours before the incident he had seen “a strange luminous device that made no noise whatsoever” flying to the south of Petare, and that other people and seen it as well. Later, at two o’clock in the morning, an explosion was heard over Buena Vista Street and other areas of the Caracas Valley. Another witness was Dr. Julio Garcés, a lab technician at the Pérez de León Hospital in Petare. He said that shortly after two a.m. on Sunday morning, while driving near Buena Vista in his car, he heard a something like a “scream of terror” issued by a “squealing voice”. He stopped to see what was going on, but saw nothing. All he could hear was screams, but was unable to ascertain their origin. Also, Mrs. Elsa Duderstadt, a resident of Calle 9 in Los Palos Grandes, said that she was in her garden when she noticed a very bright light toward Petare. It was a very intense light, rising skyward in the shape of a disk, changing color and flaring for a few minutes. Her son, Rodolfo Duderstadt, reiterated his mother’s statements categorically and noted: “The sighting we have had has given us much to think about, as it occurred at the same time as in Petare. We did not know about the details of the case until it appeared in the newspapers.” Ms. Ursula Wiede, a niece of Mrs. Elsa Dudterstadt, also had the chance to see the strange object. Resdients of the Los Caobos urbanization living along the old rail line that leads to the city of Petare, noted that on that very same morning, and at the exact moment, they saw a very bright light passing over their homes, lighting their rooms with bright flashes. Many abstained from making statements to the press to avoid being derided as insane or being summoned by National Security, which had looked into the matter. Mrs. Avelina Del Paso, a resident of Calle Andrés Bello, noted that several police and “National Security” cars reported to the area to assert control and search the streets, homes and lots where the explosion was felt after the light had gone by. Mr. Francisco Leal, a resident of Calle 7, felt the explosion much like other residents of the sector. Entire families were outside their homes, standing in fear, discussing the possibility that it could be some sort of “weapon”, indicating that according to statements made to the police, it was a bluish, intense light that moved upward. Everyone heard the strange noise. Thus ends the report of an event that is still remains unclear, even among our contemporary UFO reports, because the media (the press) and science are unwilling to disclose it to the public, do not want to study it or even acknowledge it.